Located in the heart of city, Casino 36 has it all; a variety of gaming options, friendly staff, vibrant atmosphere and exciting tournaments. Games include American Roulette, Blackjack, Three Card Poker, Electronic Roulette and £4,000 jackpot slot machines. Also available are International Rummy games on Monday and Friday, Mahjong games and daily Texas Hold 'Em poker games as well as weekly tournaments. The restaurant at Casino 36 offers a fabulous menu complete with great wine list while the bar offers a variety cocktails, spirits and wines. 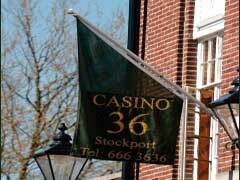 No membership is required to play or dine at Casino 36 and everyone over the age of 18 is welcome. The casino is open 7 days a week. Electronic games are available from noon to 6am while gaming tables are available from 2:30pm to 6am. The restaurant which overlooks the gaming floor offers a complimentary buffet to their members every Monday, Wednesday and Sunday from 9pm onwards. Also available is a full a la carte menu, a range of freshly prepared sandwiches and other finger food. The fully stocked bar caters to every occasion and has special offers daily.